Patio Place offers San Clemente great deals on brand name patio furniture, fire pits, bar stools, gas logs, umbrellas, barbecues, kegerators, outdoor fridges, and more. We are known for providing an unbeatable value to San Clemente customers as we sell closeout buys from the finest brands on the market, including Patio Renaissance, Hanamint, Galtech, Fire Magic, Alu-Mont, Treasure Garden, Gensun, Telescope, and others. We also pride ourselves on offering unparalleled customer service at all times. In business since 1989, our family-owned business has the experience and expertise necessary to provide reliable, expert recommendations that are unique to each San Clemente customers. We'll help you match your existing decor, stay within your budget, protect your investment, and leave feeling satisfied with your purchase. 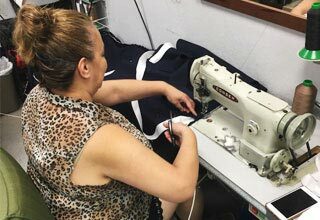 We also help those in San Clemente when they need expert umbrella repairs, patio furniture frame refinishing, barbecue parts replacement, and skilled fabrication of custom replacement outdoor cushions, pillows, slings, and straps at cost-effective rates. With lasting repairs, same-day delivery, unbeatable pricing, and unparalleled customer service, Patio Place continues to offer the best value throughout San Clemente and the larger Orange County area. So come by our conveniently located showroom today. We're open any day of the week. We offer San Clemente customers the best selection of brand name patio furniture in extruded aluminum, cast aluminum, and wicker styles. Available for significantly discounted prices, our patio furniture comes from Gensun, Hanamint, and other top-rated manufacturers. From this season's patio furniture to last season's closeout buys, we offer the best pricing on all kinds of patio furniture sets, dining sets, sectionals, benches, bistro tables, chaise lounges, lounge chairs, lounge beds, loveseats, modular seating, ottomans, sofas, and more. We also provide customers in San Clemente with same-day delivery and setup, and will remove and dispose of your old patio furniture for no additional fee. View our collection today. Our huge selection of brand name patio umbrellas is available to San Clemente customers for unbeatable prices. We sell and deliver top-quality patio umbrellas from Galtech, NorthCape, Treasure Garden, and more, in a range of styles, colors, and sizes. 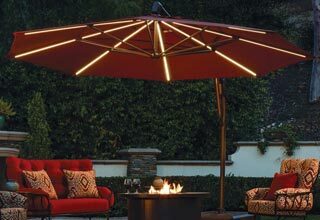 Our assortment of umbrellas includes cantilever umbrellas, auto tilt umbrellas, lighted umbrellas, and table umbrellas. We also carry umbrella accessories, such as bases, ranging from 50 to 80 pounds, and umbrella lights in solar and plug-in designs. Moreover, any of our patio umbrellas can be silkscreened with artwork, a logo, or a name -- perfect for San Clemente restaurants. Visit us today for the best pricing on brand name fire pits, fire tables, and bar stools. San Clemente residents have been coming to us for years because we negotiate the best deals from OW Lee, Alumont, and other leading brands. We can custom order specially made fire pits and fire tables, and stock a huge inventory of closeout buys from previous seasons. 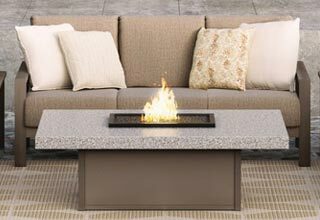 Our most popular fire pits and fire tables come in slate, marble, and cast aluminum styles, which can be coordinated beautifully with patio furniture from our selection. 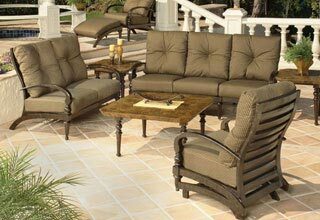 Choose from patio chairs, sofas, benches, and bar stools. We provide San Clemente customers with the finest selection of barbecues, grills, and gas logs from the industry's top brands, all for the lowest prices in Orange County. Our inventory includes Fire Magic grills and barbecues in various sizes, and Real Fyre gas logs. We can convert our barbecues to gas or propane, and offer removal and replacement services for common barbecue parts, such as range hoods, lights, doors, and burners. We can also install our Real Fyre ceramic gas logs at your San Clemente home or business, making sure to connect it to your existing gas ling. Visit today to learn about our various barbecues, grills, and gas logs, as well as river rocks, reflective fire glass, and lava rocks, fridges, kegerators, drawers, faucets, and sinks. Call today to have Patio Place restore your old, worn, or broken patio furniture to like-new condition. For a reasonable rate, we can give weathered outdoor furniture frames in San Clemente a pristine look and increased durability by carefully applying a liquid, refinishing treatment. For damaged patio furniture cushions in San Clemente, we offer cost-effective, custom-made replacement cushions and pillows, including replacement ottoman pads, settee pads, deep-seat cushions, bench cushions, and more. With over 600 Sunbrella, Phifer, and original manufacture fabrics to choose from, we have options to suit nearly any budget, decor, or style. Call today to learn more about how we can help revive the look of your patio furniture in San Clemente. We provide San Clemente with cost-effective patio umbrella repairs, including umbrella rib replacement, umbrella restringing, and umbrella recovering. For all our patio umbrella repairs, we achieve attractive, long-lasting results by using only the highest quality parts, fabrics, and components. In fact, many of our outdoor fabrics are warrantied for years against fading, mildew, and other environmental damage. We can often perform umbrella repairs onsite at any home or business in San Clemente. Call today. Protect your San Clemente patio furniture, fire pits, and other outdoor equipment with standard and custom-made covers from Patio Place. Unlike covers found at hardware and other bargain stores, our covers are easy to use, designed to last for years, and can be made to fit any size patio furniture, fire pit, barbecue, or other equipment. To learn more about our covers, call today.